"My government took an important step towards unshackling the IIMs, freeing them from the clutches of restrictions and regulations set by the government. "We intend to do the same for our universities and ensure that our centres of higher learning figure among the best 500 in the world," Modi said. "Even our critics will admit that unlike in the past, when political parties used to promise various yojnas with upcoming elections in mind, we always launch a scheme and make sure that we prepare a roadmap to fulfill it too," Modi said in an apparent dig at the UPA. "I meet several people from rural India. We are working tirelessly to fulfil their aspirations. 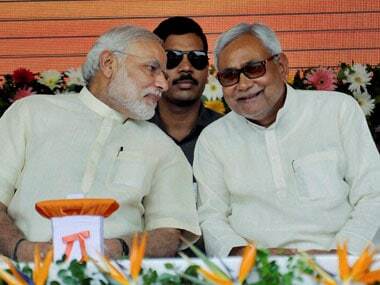 And, projects whose foundation stones are being laid will give impetus to Bihar's development," Modi said. Calling river Ganga the lifeline of India, Modi said, "Our first priority is that river Ganga must not be polluted. We are running this campaign to stop any waste from entering river Ganga." Modi slams opposition leaders, says they have been dragging India back. He said that while leaders in the past were skeptical of developing roadways, the NDA government is in the process of doubling the pace of road building as part of Pradhan Mantri Gram Sadak Yojna. "I can see a sea of humanity at this gathering. There are far more people at this rally, then it can hold. Yet, despite reeling under severe heat, they have come to bless us. I am thankful to them. " "The Centre has changed the fate of Bihar by launching so many schemes. I thank the Bihar government for implementing all central schemes, The Bihar government and the Centre is working in tandem to help the state prosper," Modi said. “I request you to construct road connecting Buxar and Banaras as the number of pilgrims travelling to Banaras is quite high,” Nitish Kumar said while addressing the gathering. The four highway projects for which the foundation stone has been laid, include the four-laning of Aunta-Simariya section of NH-31 and the construction of six-lane Ganga Setu at a cost of Rs 1,161 crore. The other projects are four laning of Bakhtiyapur-Mokama section of NH-31 spending Rs 837 crore, two-lane construction of Maheshkhunt-Saharsa-Purnea section of NH 107 at a cost of Rs 736 crore and two-lane construction of Bihar Sharif Barbigha-Mokama section of NH-82 at the cost of Rs 297 crore. Before Chief Minister Nitish Kumar, Union ministers Nitin Gadkari and Ram Vilas Paswan spoke from the dais. After Nitish, the prime minister is expected to address the gathering. What can history aficionados find in the new Bihar Museum? Different galleries at the museum showcase the state’s heritage and its contribution to world civilization — from the figures of Buddha and Mahavir, to the Nalanda University, the Bihari diaspora (known as girmitiya labourers) of the 19th and 20th centuries, and Mahatma Gandhi’s first satyagraha from Champaran. Also highlighted here, are the philosophy of Chanakya and the reign of Emperor Ashoka. Unprecedented security arrangements are in place for Prime Minister Narendra Modi's visit. Patna has been turned into a fortress with thousands of security personnel deployed and traffic diversions made. Additional Director General of Police (Headquarters) said seven Superintendents of Police and 12 deputy SPs have been deployed to oversee the security arrangements and regulation of road traffic during nearly five-hour stay of the prime minister in the state. "Four companies of the Bihar Military Police and a Quick Response Team comprising eight units of Special Task Force and two of Anti-Terrorist Squad have also been deployed," he said. "Special arrangements have been made for Mokama where one company of CRPF and two units of STF will be assisting the local police in maintaining security," Singhal said. What is on Modi's agenda in Mokama? 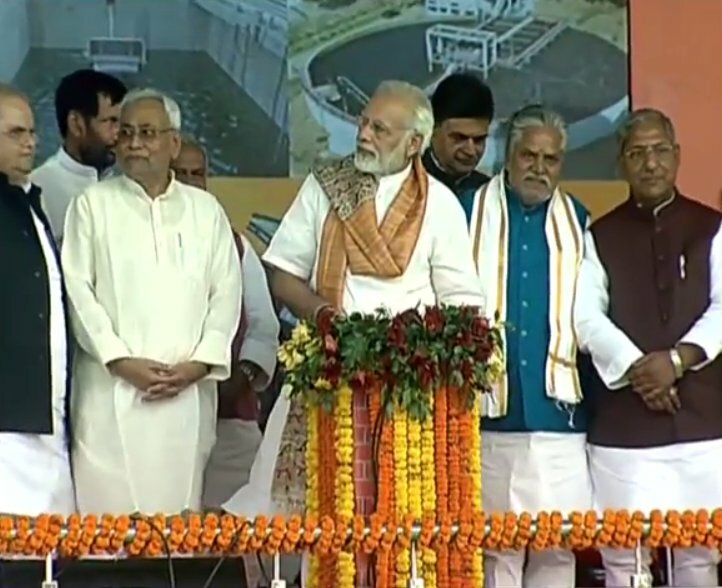 Modi is to lay the foundation stones for several projects, including four sewerage projects under the Namami Gange project and four national highway projects in Mokama area of Patna district. Nand Kishore Yadav, the senior BJP leader and state Cabinet minister claimed that out of Rs 1.25 lakh crore of the package announced by the prime minister, around Rs 55 crore are for road and rail projects. There is no shortage of money, he claimed added tha there will be 16 bridges on river Ganga in the next five years, which was only four till a few years ago. Will Modi's new announcement improve quality of Higher Education? Prime Minister Narendra Modi will fly by helicopter to Mokama, which is in Patna district about 100 km from the capital city, News18 is reporting. "In 2022, when India celebrates 75 years of Independence, I want my Bihar to be among the prosperous states of the country," Modi said while praising Nitish Kumar's committment towards the people of Bihar. Urging universities tap their alumni network to gain funding, Modi said that alumni play a major role in driving any university. He said that status and pride that comes with alumni always help an university. He added that the alumni culture is in its infancy in India, reiterating that universities need to tap them to seek funding and stop being dependent on government for funds. Once upon a time, our ancestors used to play with snakes but now our new generation is playing with mouse (computer), said Modi while narrating an incident he encountered in Taiwan. "Only a country which gives importance to innovation will succeed. But innovation does not mean modification. Remember that IT revolution has helped India' change the perspective towards it. Before IT revolution, India was always considered a country of snake charmers and black magic," says Modi. "Education's job is to clear the minds of students but our idea is to fill it with rote learning. Education also means to have an open mind. Universities need to start a campaign to help students open their minds," Modi said. The seeds of Patna University were sown 100 years. Student studied here and then helped India reach newer heights. Thanks to Patna University, the top 5 students who are selected for UPSC each year are from this university," Modi said. 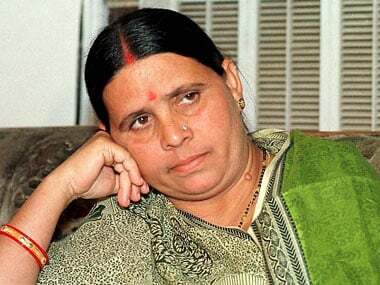 "Nitish told me I am first prime minister to come to Patna University. It is a previlage for me. I have observed that former prime minister's have left many good things for me. I now have the previlage to complete them," Narendra Modi said. Meanwhile, the Bihar governor Satya Pal Malik is finding it difficult to keep his eyes open! "Mahatma Gandhi stressed on cleanliness (swacchta) while being in Champaran. Gandhiji also spoke of literacy and education in Champaran, which did not even have a school. Champaran Satyagraha was a major event in giving farmers' their rights," Nitish Kumar told the gathering. Nitish Kumar said, "Patna University was founded in the year when the Champaran Satyagraha took place. I hope the central government will grant the Central University status to Patna University." However, a minor controversy has erupted with actor-turned-politician and local BJP MP Shatrughan Sinha raising the issue of not being invited to the programme despite being a Patna University alumnus. Sinha has also questioned the rationale behind the exclusion of senior BJP leader Yashwant Sinha and RJD chief Lalu Prasad from the function despite being university alumni. Will Patna University be declared a Central university? There has always been a demand for making PU a central university since the past three or four decades, The Times of India notes. While the state government has given its nod on different occasions, nothing concrete has happened till now. According to The Times of India report, vehicular movement will be restricted on certain roads during Modi's visit to Patna. Only government vehicles, ambulances, fire tenders and vehicles of doctors and civil court lawyers will be allowed to move from Kargil Chowk towards Ashok Rajpath in Patna. The report also added that only vehicles with passes will be allowed to go to Patna University. According to The Indian Express, after a rousing welcome at the Patna Airport, Modi will be proceeding towards Science College Ground for the centenary celebrations.of Patna University. The prime minister was welcomed by Bihar governor Satyapal Malik and Chief Minister Nitish Kumar at the airport. 1.30 pm: Modi is scheduled to lay the foundation stone of projects under Namami Gange programme, and National Highway projects at a public meeting in Mokama. The prime minister's visit has gained political significance for two reasons. He is coming to Bihar for the first time after Nitish's return to NDA fold and the occasion will also mark the presence of Lalu Prasad Yadav who started his political career as students' union leader of the university among others. What's the status of development projects in Patna? In Patna, seven other sewerage projects are already at various stages of implementation. The existing population in the city is 16.83 lakh and the existing sewage generated in the city is 220 MLD and sewage load is expected to be 320 MLD by the year 2035. "Considering the existing treatment capacity of the city and existing waste generation and (estimated) waste generation till 2035, a total of 11 projects under World Bank funding are sanctioned for six zones which will create a total of 350 MLD of STP capacity and will lay down 1140.26 km of sewerage network at a cost of Rs 3582.41crore," an official statement said. After completion of these 11 projects, Patna will become a town having 100 percent sewerage infrastructure and no sewage water will drain into Ganga, it said. 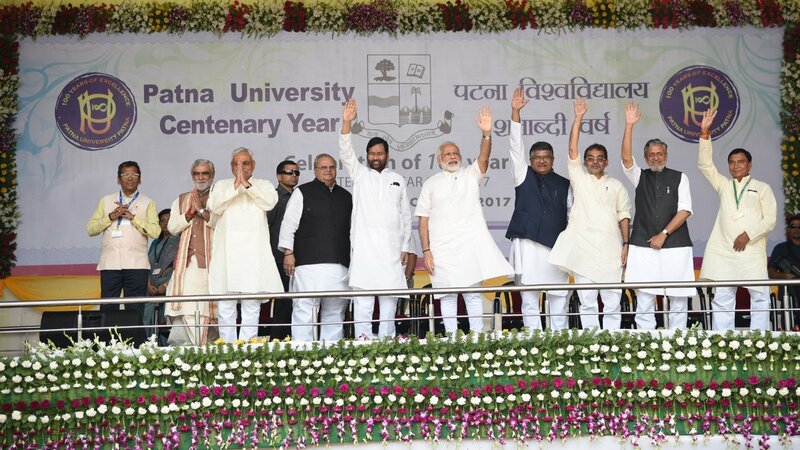 Union ministers Ravi Shankar Prasad, Upendra Kushwaha, JP Nadda, Ashwini Choubey, Ram Vilas Paswan, and deputy chief minister Sushil Kumar Modi are alumni of Patna University. Bihar chief minister Nitish Kumar is also a graduate of the Patna University. Will Modi grant special status to Bihar? All eyes are on Nitish whose party and he himself has been demanding special status for the state. The chief minister, a few days ago, argued that Bihar was a landlocked state which prevents it from being a favourite destination for private investors thus the state requires special attention. "The prime minister will lay foundation stones of four road and bridge projects. 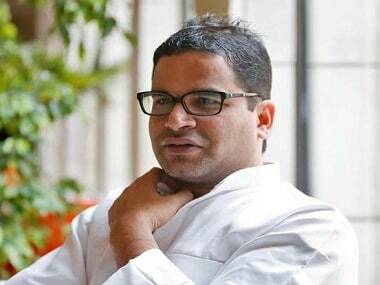 It includes six-lane bridge on river Ganga, Mokama-Bakthiyarpur four-lane road, the four-lane bridge on river Koshi between Birpur and Bihpur section in Supaul, two-lane road between Maheshkut and Purnia and four sewage treatment plants (STP) in Patna," state minister Nand Kishore Yadav said. Will BIhar get a Diwali bonanza? Preparations were in full swing at the Patna University for Saturday's function. The prime minister will address the Centenary Celebrations of Patna University. According to reports, it will also be the first time that a sitting prime minister to visit the university. At Mokama, Modi will lay the foundation stone for four Rs 3,031 crore national highways projects and as many sewage treatment plants (STPs) and related works worth Rs 738.04 crore on Saturday, an official statement said. This will be the prime minister's first full-fledged official tour to the state since the BJP became a part of the ruling coalition in Bihar in July in 2017. In August, Modi along with Chief Minister Nitish Kumar had made an aerial survey of the flood-hit districts of Bihar. After attending the Patna University function, the prime minister will fly by a helicopter to Mokama, which is in Patna district about 100 kilometres from the capital city. Modi will launch a number of development projects in Patna. The four highway projects for which the foundation stone will be laid, include the four-laning of Aunta-Simariya section of NH-31 and the construction of six-lane Ganga Setu at a cost of Rs 1,161 crore. The other projects were four laning of Bakhtiyapur-Mokama section of NH-31 spending Rs 837 crore, two-lane construction of Maheshkhunt-Saharsa-Purnea section of NH 107 at a cost of Rs 736 crore and two-lane construction of Bihar Sharif Barbigha-Mokama section of NH-82 at the cost of Rs 297 crore. The sewerage projects include development of STPs and related network at Beur and Saidpur. These will create a capacity of treating 120 million litres daily (MLD), the statement said. The project also includes upgradation of existing 20 MLD-capacity system. Besides, sewer network of 234.84 kilometres will also be developed in the Beur and Saidpur zones, the statement said. In Patna, seven other sewerage projects are already at various stages of implementation. The existing population in the city is 16.83 lakh and the existing sewage generated in the city is 220 MLD and sewage load is expected to be 320 MLD by the year 2035. "Considering the existing treatment capacity of the city and existing waste generation and (estimated) waste generation till 2035, a total of 11 projects under World Bank funding are sanctioned for six zones which will create a total of 350 MLD of STP capacity and will lay down 1140.26 km of sewerage network at a cost of Rs 3582.41crore," the statement said. The impoverished state has high hopes from the prime minister, who had announced a "package" of Rs 1.25 lakh crore in 2015. Meanwhile, tight security arrangements were in place for the prime minister's visit. Additional Director General of Police (Headquarters) said seven Superintendents of Police and 12 deputy SPs had been deployed to oversee the security arrangements and regulation of road traffic during nearly five-hour stay of the prime minister in the state. Preparations were also in full swing at the Patna University for Saturday's function. However, a minor controversy has erupted with actor-turned-politician and local BJP MP Shatrughan Sinha raising the issue of not being invited to the programme despite being a Patna University alumnus. Sinha has also questioned the rationale behind the exclusion of senior BJP leader Yashwant Sinha and RJD chief Lalu Prasad from the function despite being university alumni. Patna University vice-chancellor Rash Bihari Prasad Singh, however, sought to clear the air over the issue, claiming that the "printing of invitation cards got delayed and that's why cards have not been sent to them. But, they are very much in our guest list".